The party season is now well under way. This week has been the start of many office Christmas parties which will no doubt go into next week. Restaurants and parties everywhere will be having special Christmas Menus and the tables will be laid out with Christmas Crackers and Christmas Party Blowouts. There will also be loads of Santa Hats being worn and Christmas Decorations such as Tinsel Stars and Tissue Bells will be put up for everyone to enjoy creating the perfect Christmas mood. There are then just a few days break to get over the Christmas festivities before starting again with New Years Eve Parties. There are lots of different ways to celebrate New Year which range from restaurant do’s and hotel events to parties at home or other private venues. 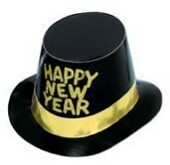 New Years Eve party goods always add to the atmosphere at this time of year and whether you are having a Masquerade Ball and looking for Masks or just fun Hats we have a fantastic choice for New Year as well as New Year Party Packs to buy. Glasses for 2015 are the ideal New Years Eve party products to hand out and add to the good time that everyone is having. It is not too late to order any Christmas party supplies that you may still need including Christmas Fancy Dress Costumes, a Red Santa Suit or even Christmas Stocking Fillers. Noisemakers are popular for any Christmas or New Year Party as are Christmas Streamers so take advantage of our choice of delivery options and have a lovely fun and happy Christmas and New Year. Have you got everything you need for your parties? We would love to hear how you are planning to spend the party season.